The organizers of Friday's show hope to raise $100 million in TV and internet broadcasting rights for the humanitarian aid effort in Venezuela. Watch the live broadcast here. On Friday, a bridge between Colombia and Venezuela will be the setting for a large concert to call the world’s attention to the humanitarian crisis that is taking place in Venezuela. Univision will be on the scene, bringing it to you live. Dozens of the most noted Latin American artists will take part in the concert in solidarity with Venezuela and to demand that Nicolás Maduro allow the entry of humanitarian aid that has been gathering in bordering countries in recent weeks. The Colombian city of Cúcuta has become the main collection spot for the aid as well as being the main exit point for thousands of Venezuelans escaping the political and economic crisis in the oil-rich South American country. The show is being organized by British entrepreneur Richard Branson and, although tickets will be free, organizers plan to raise an estimated $100 million in TV and internet broadcasting rights. Reymar Amoroso and Santiago Cruz will open, followed by José Luis Rodríguez ‘El Puma,’ Reynaldo Armas, “El Cholo” Valderrama and Jorge Glem. Wrapping up the event will be Ricardo Montaner, Diego Torres, Alejandro Sanz, Maná, Juan Luís Guerra, Luís Fonsi, Miguel Bose, Fonseca, Maluma, Carlos Vives and Juanes. Venezuelan Franco de Vita will head up the closing act. All emcees will be Venezuelan: Lele Pons, Nelson Bustamante, Patricia Velásquez, Patricia Zavala, Catherina Valentino and Luis Chataing. Artists will be on a rotating stage that will allow for two simultaneous performances. Las Tienditas bridge, Cúcuta. Friday, Feb. 22 from 10:00 a.m. to 5:00 p.m.
Organizers say that the doors will open at 6:00 am to allow entry by the public. The show will take place at the Colombian end of the 300-meter-long Tienditas bridge to Venezuela, which has become symbolical roadway after the Venezuelan government blocked it with shipping containers and a truck a few days ago to prevent the entry of cargo from Colombia. The event will be free. Organizers expect some 250,000 people to attend, although they say that they have the capacity for 500,000. Several media outlets will broadcast the concert live on TV and the internet. 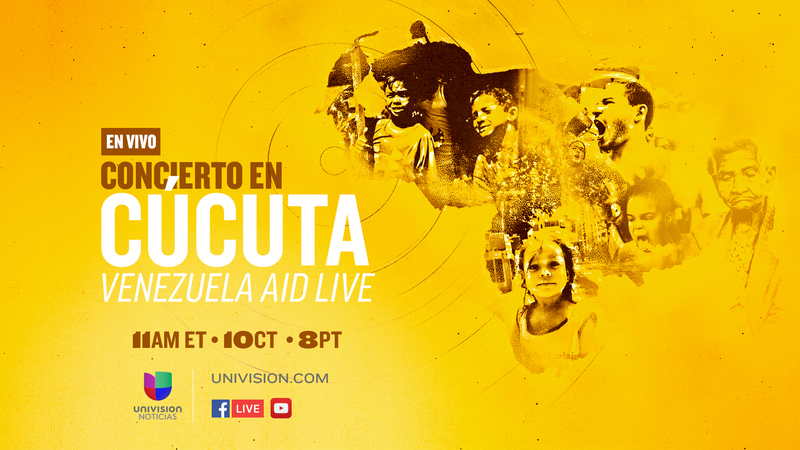 - The Univision.com and UnivisionNoticias.com pages will stream it, and the LiveBlog will offer off-stage details. - UNow, Facebook and Univision News’ YouTube channel. · Danay Rivero – will be aboard a U.S. Air Force plane delivering aid to Cúcuta. British entrepreneur Richard Branson proposed the idea, which was quickly backed by artists around the world, particularly in Latin America. “ One of our main goals is for the world to find out about the situation in Venezuela and about our interest as organizers in the humanitarian aid issue. This event is being held in order to save thousands of lives,” said Fernán Ocampo, one of the organizers of the concert.